This paper presents a complete solution for the integration of robots and wireless sensor networks in an ambient intelligence scenario. The basic idea consists in shifting from the paradigm of a very skilled robot interacting with standard objects to a simpler robot able to communicate with smart objects, i.e., objects capable of interacting among themselves and with the robots. A smart object is a standard item equipped with a wireless sensor node (or mote) that provides sensing, communication, and computational capabilities. The mote’s memory is preloaded with object information, as name, size, and visual descriptors of the object. 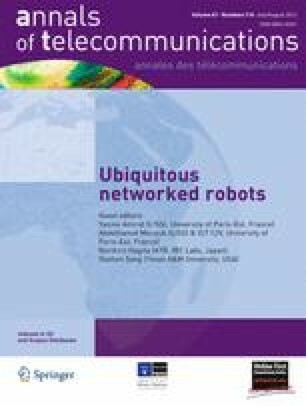 In this paper, we will show how the orthogonal advantages of wireless sensor network technology and of mobile robots can be synergically combined in our approach. We detail the design and the implementation of the interaction of the robot with the smart objects in the environment. Our approach encompasses three main phases: (a) discovery, the robot discovers the smart objects in the area by using wireless communication; (b) mapping, the robot moving in the environment roughly maps the objects in space using wireless communication; (c) recognition, the robot recognizes and precisely locates the smart object of interest by requiring the object to transmit its visual appearance. Hence, the robot matches this appearance with its visual perception and reach the object for fine-grain interaction. Experimental validation for each of the three phases in a real environment is presented.